Home Tags Posts tagged with "FOI"
GRAND RAPIDS, Mich.—When the deeds of Muslims are discussed among the American public, positive activities are rarely acknowledged and negative connotations, often amplified through the rhetoric of policymakers, mass media, and the general population, cause many to judge the faith with doubt and suspicion. However, in recognition of his quick thinking and actions, Bro. Suni X (Musawwir) of the Nation of Islam, received a Citation of Appreciation from the Grand Rapids Police Department honoring his conduct in capturing an armed robbery suspect of the Captain Jay’s Fish & Chicken restaurant on the city’s Southeast Side. Although the incident occurred in July 2016, it wasn’t until late January of this year that Bro. Suni received a call from the Grand Rapids Police Department notifying him of the award. Downplaying the significance of his part in taking down the alleged suspect, it wasn’t until about three weeks after receiving the citation that he told the Believers and Student Laborers of the Grand Rapids Study Group. “I was in my van at the time and listening to music and a Caucasian individual walked out (of the restaurant), casually, and as he proceeded South, I noticed he was looking around and I thought he was afraid because he was walking in a Black neighborhood, but when he got down the block, the manager and others came out hollering and screaming, ‘we’ve been robbed; it was a White guy,’” Bro. Suni recalled the restaurant employees as saying. After a brief foot chase, Bro. Suni tackled the perpetrator and a neighborhood resident, watching from his front porch, helped to pin him to the ground, holding the alleged robber in place until authorities arrived. Although Bro. Suni said the restaurant employees told him the man was armed, Bro. Suni said he wasn’t thinking of him as having a weapon as much as he was thinking of stopping a criminal act in his community. New Orleans, La. – On the eve of the New Year, the city of New Orleans murder total had eclipsed the 200 mark, making it again a top contender for the country’s highest per-capita murder rate, a title the city previously held in 2006. An accurate per-capita rate for murders and all crimes remains elusive, because of varying estimates of the cityâ€™s post-Katrina population. But even by the most generous estimate, preferred by the New Orleans Police Department, the city’s murder rate is 67 murders per 100,000 people. Using another lower population estimate cited by the city, the rate would be 71. At the turn of the year the citizens of New Orleans watch reports concerning the newest murders of 2009 â€“ the most gruesome of all being the killing of a 2-year-old child by his father. Continuing their efforts from last year, the Fruit of Islam (F.O.I.) 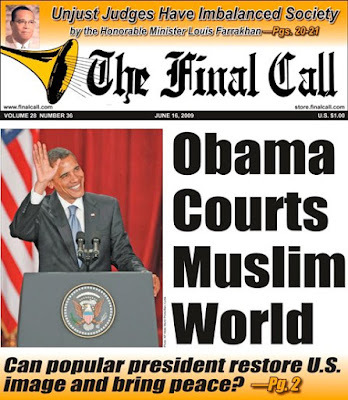 of Muhammadâ€™s Mosque No. 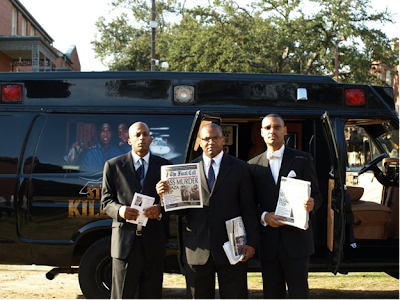 46 teamed up with a Baton Rouge Hip Hop artist known as Brother Arthur â€œSilky Slimâ€ Reed on January 10 to spread the message of â€œStop the Killingâ€. â€œI first became aware of the work of Brother Arthur while living in Baton Rouge some months after Hurricane Katrina. Since that time we have worked together to help our people and enlighten the youth. When he informed us about what he was doing with the ambulance he purchased and refurbish, we thought it would be a good idea for him to come to the city, so we hit the streets together,â€ stated Student Minister Willie Muhammad. Brother Arthur purchased and remodeled a used ambulance to become a vehicle that will resurrect the Black community versus transporting dead bodies. It is coated with an image of himself and inmate Surge Sherman. Mr. Sherman is currently serving a life sentence in the Angola state prison. Despite being behind bars, he co-authored a book with Brother Arthur that teaches conflict resolution skills to youth. Inside of the ambulance there is a flat screen television that shows portions of a documentary about the negative consequences of street life. â€œI named the ambulance Life and Death, because ambulances are used to save lives and they also transport those who have lost their lives. The ambulance is a visual tool that gets the message across. The footage of actual murder scenes are used to help onlookers see why they need to turn away from the destructive lifestyle of the streets. The expression on the faces of those who saw the footage and their reactions show that the ambulance helps to effectively get the message across,â€ stated Brother Arthur. As the people left the ambulance they were given a CD containing a lecture by the Honorable Minister Louis Farrakhan speaking on stop the killing by the FOI. â€œI give all praises to Allah. I think that the ambulance helped in our effort to go after our people and invite them to hear the truth,â€ stated Brother Patrick X. In the music industry, Brother Arthur has worked with the likes of Young Boosie and Lil Webbie. He also was the founder of the Southside Wrecking Crew, one of the early gangs in Baton Rouge. Since then he has transformed his life and travels the state of Louisiana speaking to youth, churches, schools and in various prisons. He and the FOI visited two of the remaining housing developments in New Orleans and other neighborhoods in the city. The ambulance blasted Hip-Hop songs written by artists rapping about the lost of loved ones to senseless street violence. Within minutes of the ambulance being parked members of the community â€“ men, women and children came to see what was going on. â€œWe should have every child wear red shirts that say stop the killing on the front and the back,â€ suggested 12-year-old Royon, who was touched very deeply by the documentary she viewed in the ambulance. â€œThis is a good thing that they are doing. I want to see them do it more to help stop this killing. I hope more people will come out to see this,â€ stated Sharon Hall, a resident of one of the housing developments.